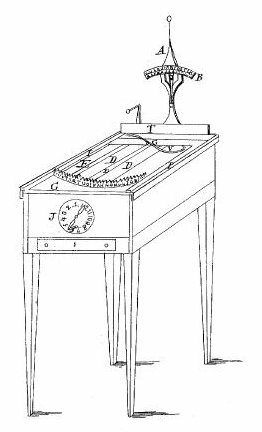 The 52nd man to attempt the invention of a successful writing machine was Christopher Latham Sholes. Frenchmen, Austrians, Italians, Swiss, Englishmen, Russians, Americans had been trying for at least a 150 years before Sholes started. Some of the machines made raised letters for blind people to read with their fingertips. Some had letters which were arranged like keys on a piano and were almost as large – and so really rather clumsy. All the machines had one great problem. They were as slow or slower than writing with a pen. The first inventor of a writing machine, an English engineer called Henry Mill, had the right idea. He described it as ‘An Artificial Machine or Method for the Impressing or Transcribing of Letters Singly or Progressively one after another, as in Writing, whereby all Writings whatsoever may be Engrossed in Paper or Parchment so Neat and Exact as not to be distinguished from Print’. Queen Anne granted him a patent in 1714, but not even a drawing survives of his invention. 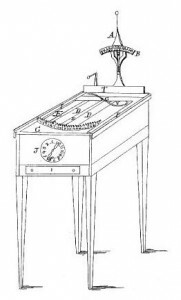 The first writing machine in America had been invented in the backwoods up near the Great Lakes by a surveyor called William Austin Burt, in 1829. Burt’s Typographer was a clever machine. The letters were arranged on a semicircular band of metal which moved to bring each letter to the printing point as it was needed, rather like a hand-held labelling machine today. The editor of the local newspaper saw the real possibilities of the machine, THIS IS A SPECIMEN OF THE PRINTING DONE BY ME ON MR. BURT'S TYPOGRAPHER, he wrote to the President of the United States. YOU WILL OBSERVE SOME INACCURACIES IN THE SITUATION OF THE LETTERS; THESE ARE OWING TO THE IMPERFECTIONS OF THE MACHINE, IT HAVING BEEN MADE IN THE WOODS OF MICHIGAN WHERE NO PROPER TOOLS COULD BE OBTAINED BY THE INVENTOR ... I AM SATISFIED ... THAT THE TYPOGRAPHER WILL BE RANKED WITH THE MOST NOVEL, USEFUL AND PLEASING INVENTIONS OF THIS AGE. This promoter did not have any money to back the Typographer, so he took Burt down to the big city, New York, to find someone who would invest money in developing and manufacturing it. No one was interested. Burt didn’t mind. He went back to his log cabin and finished inventing something-he considered much more important: a surveying compass that used the sun to find direction instead of the earth’s magnetic attraction. It became United States government standard equipment for the next seventy-five years. Christopher Latham Sholes, a gentle, tall, thin man who was a moderately successful newspaperman, printer, and local politician, liked spending his spare time in a Milwaukee, Wisconsin, machine shop with his friends, designing things. Carlos Glidden was making a spading machine which he thought should replace the plough, and would bring him a fortune. Sam Soule was helping Sholes invent a large heavy piece of machinery for numbering pages. “If you can do that”, said Glidden, “why can’t you make a machine that will print words as well as figures?” Sholes didn’t take much notice, but a few months later he read an article in a magazine describing several inventors’ attempts to design a mechanical writer. “Why don’t I try”, thought Sholes. There were plenty of good reasons why people continued their efforts to invent a writing machine. The fastest anyone could write with a pen was 30 words a minute, and that was really annoyingly slow, besides being difficult to read. In 1844 Samuel Morse demonstrated his electric telegraph to the United States government. Now telegraphers could send and receive a message in code much faster than they could write it down. And shorthand secretaries could take notes as quickly as a man could speak – yet they had to be written out slowly by hand. 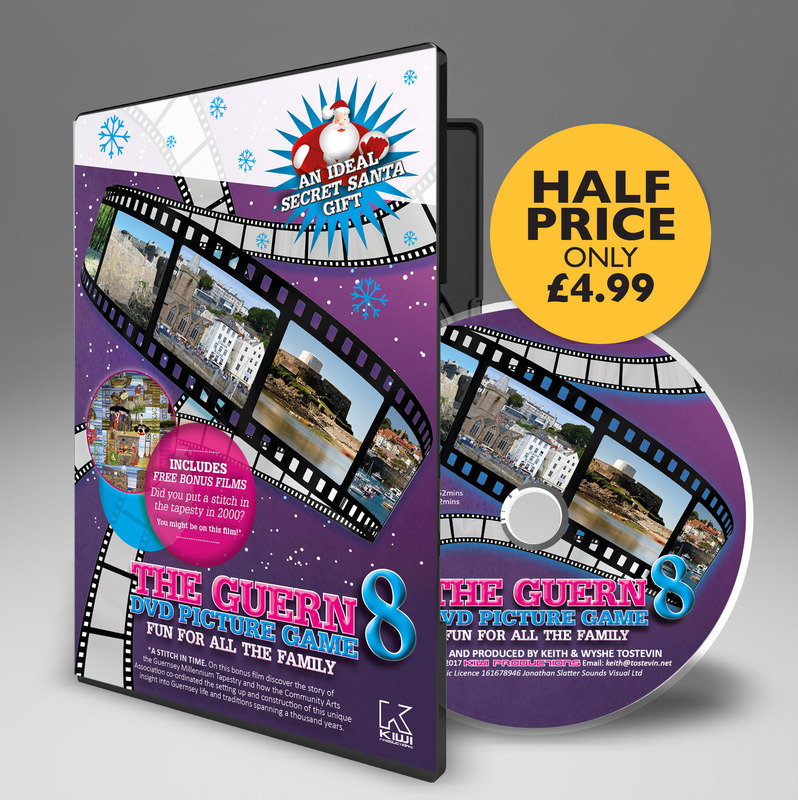 A personal printing-press would speed things up wonderfully. Sholes thought about the problem of how to arrange the letters on a writing machine. It should be possible to put them around the edge of a wheel, like his numbering machine. One night when he could not sleep, a better idea came. Each letter, or ‘type’, could be put on a separate bar so that each could strike the paper and make a letter independently from the others. In fact, unknown to Sholes, this method had been worked out by a Frenchman over 30 years before. During the next couple of days Sholes got a sheet of the newly invented carbon paper from the town telegraph office and rigged up a little machine using odds and ends, which tried out his principle with one letter, W. WWWWWWW it typed. With help from his friends Glidden and Soule and one of the mechanics from the machine shop, Sholes built a complete writing machine. He was now 48 years old. ‘c. latham sholes, sept. 1867‘ he typed on it. They built an improved model and Sholes wrote – using the new machine – to everyone he could think of, asking for financial backing. He wrote to a big, loud, red-faced man, James Densmore, with whom he had once published a newspaper. “I’ll come immediately,” Densmore replied. 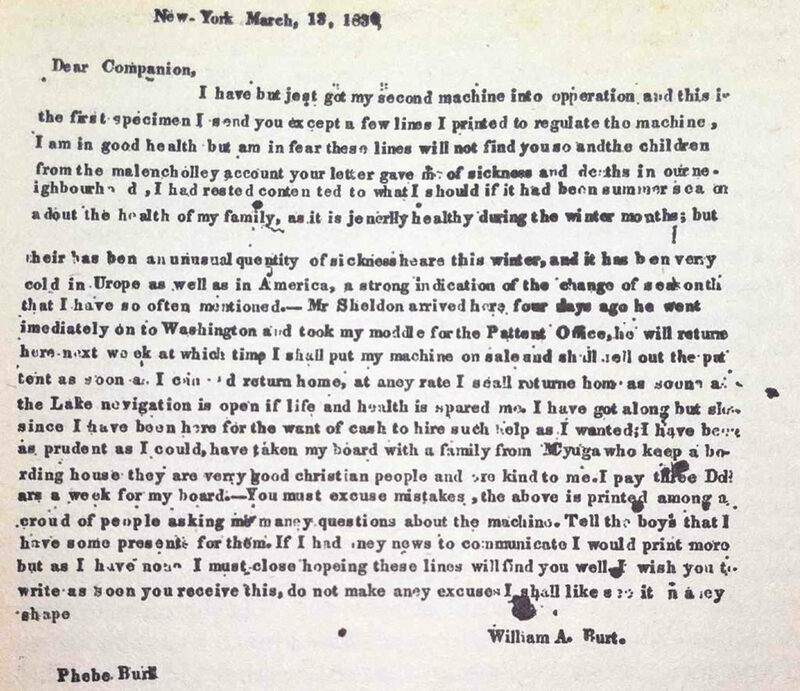 He liked the idea of a writing machine as much as William Austin Burt’s newspaper editor had 40 years earlier. Densmore agreed to pay the back bills: $600, plus expenses to come, in return for a share in the profits of the machine. In fact, although Densmore had invented and patented the first oil tank for a railway truck, he had very little money. Poor Sholes. Every time he thought he had finished, Densmore kept him at it, criticizing, enthusiastic, pushing. “If it is worth anything, it is worth a vast amount” Densmore declared. He never gave up believing in the Type-Writer, even when other enthusiasts dropped out and Sholes was ready to stop. ‘In general, the invention and the success of it have been all right from the beginning’ Densmore wrote to his brother, ‘but there have been constant minor, subordinate difficulties that have proved quite formidable; and these minor difficulties have caused us a great deal of delay and a vast amount of expense’ At times Sholes worked 16 hours a day on the latest improved model, and the money to pay for it was always spent before it arrived. Sholes’s Type-Writer combined most of the ideas already discovered by previous inventors. It could type only in capitals, and was assembled in such a way that you could not see what you had typed until you had finished. But it was fast. The rather odd order of letters on the keyboard of our typewriters today – QUERTYUIOP-was worked out by Sholes. He put the most commonly used letters farthest away from each other to stop the type bars from colliding. More efficient arrangements have been worked out since, but no one will change the layout of the keys. It would mean unlearning the familiar keyboard. At last Densmore decided the machine was good enough to sell. He tried manufacturing it himself, unsuccessfully. Then in 1873 he took it to Remingtons, manufacturers of guns, sewing-machines and farm machinery. The American Civil War had ended by now, so fewer guns were being made and Remingtons had some factory space. Two of their top mechanics adapted the Type-Writer for mass-production. Because they were sewing-machine men, the Remington Model I, the first commercially available typewriter, looked rather like a sewing-machine. It was a curiously shaped, shiny black metal box with flowers stencilled on its front and sides, perched on a stand with a foot-treadle carriage return. I AM TRYING TTO GET THE HANG OF THIS NEW FFANGLED WRITING MACHINE, BUT AM NOT MAKING A SHINING SUCCESS OF IT ... . THE MACHINE HAS SEVERAL VIRTUES. I BELIEVE IT WILL PRINT FASTER THAN I CAN WRITE. ONE MAY LEAN BACK IN HIS CHAIR & WORK IT. IT PILES AN AWFUL STACK OF WORDS ON ONE PAGE. IT DON'T MUSS THINGS OR SCATTER INK BLOTS AROUND. It was just before Christmas 1874, and Mark Twain, the famous American author (whose real name was Samuel Langhome Clemens), had fallen for the first Type-Writer he ever saw. There it stood in a shop window in Boston. Twain went inside to find out what it was. The salesman explained that this newly-invented machine could write at a speed of 57 words a minute. “I don’t believe it”, Twain said. A young girl was called over to demonstrate the Type-Writer. She dashed off the 57 words in a little under a minute. “That was just luck”, said Twain. “Do it again!” As fast as the girl typed, he stuffed the sheets of paper in his pockets for souvenirs. Then he paid a great deal of money, $125, for a machine of his own. When he got back to his hotel, he realized how he had been tricked. The specimens of typing all said the same thing. The girl demonstrator was so fast because she had memorized just one set of words. When his Remington Model I was delivered, the author wrote: ‘I played with the toy, repeating and repeating and repeating “The boy stood on the burning deck” until I could turn out that boy’s adventure at the rate of 12 words a minute; then I resumed the pen for business, and only worked the machine to astonish inquisitive visitors’ In fact, Mark Twain was the first author ever to type out a manuscript (for the book Life on the Mississippi) for the publisher. The Remington Type-Writer was at first most unsuccessful. Why pay $125 for a writing machine when a pen cost a penny? The public thought that using a typewriter was insulting. ‘ Do you think I can’t read?’ And they confused this private printing machine with the printing press. Puzzled recipients of early type-written letters wrote back: ‘Why did you need to have an ordinary letter to me printed?’ Yet by 1909 there were a total of 89 typewriter companies in the United States alone. Also on the market were German, Swiss, Italian, French, English and Japanese models. The typewriter really became popular when it began to be used in offices. At first, salesmen thought that the biggest buyers would be clergymen (for their sermons), writers, and newspapermen. The business world was for men only; offices were gloomy, and sometimes scruffy, places where copy boys sat on high stools, making often inaccurate copies of each hand-written letter before it was posted. Gradually women realized that here was a new career opening up for them. Women had jobs in factories and shops, and worked as domestic servants and cooks. A young lady with some education could only teach or be a nurse. But the type-writer offered a way into the active and interesting world of business. The first batch of girls trained in America to operate the typewriter as a career were snapped up by business houses. Type-writing schools opened all over the country. Suddenly women became office workers. Before, the only women to set foot inside offices had been the cleaners. Businessmen realized that if they bought a typewriter, they needed a woman to operate it. The typewriter probably did as much to give women freedom and independence as the action of the suffragettes. Of course there were jokes. The operator of a typewriter was called a typewriter too, for at least twenty-five years, until someone thought of the word typist. “What a pretty typewriter you’ve got there!” People thought it all very funny. But more and more girls were given jobs as typists, and the demand for them seems endless. 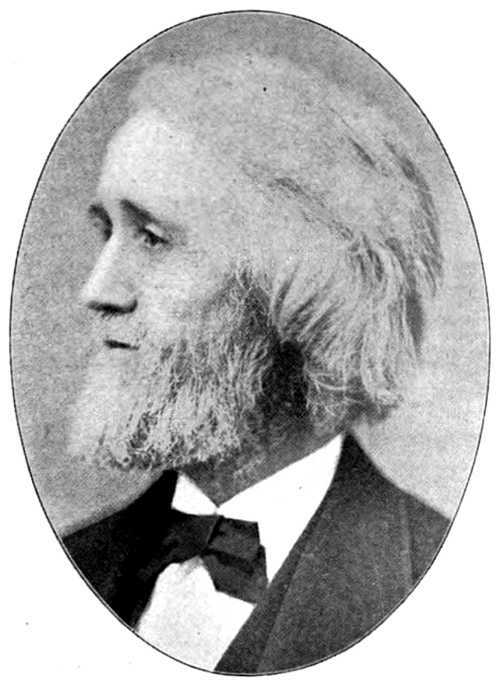 Christopher Latham Sholes never made much money from his invention; he sold his share in it before it became popular. He went on inventing typewriters, however, propped up in bed, ill, but unable to stop. Densmore became a typewriter salesman and in the end made his fortune. More inventors than ever began to work on the writing machine after its success, improving it, arguing over different techniques. Lower case (small) letters were added to the typewriter, then the design was altered so that the letters would show as soon as they were typed, instead of being hidden. 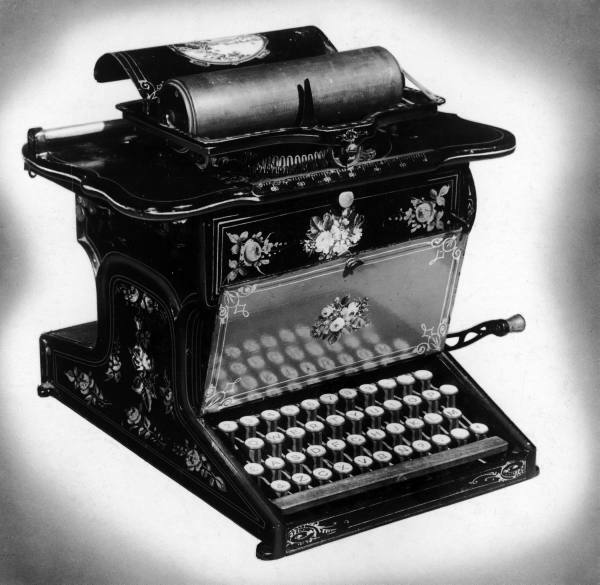 In a famous victory in 1888 Frank McGurrin beat Louis Traub at a speed-typing contest. He used all ten fingers and the touch type method of never looking at the keys. Portable, and then electric typewriters, were invented. In 1961 the IBM 72 electric typewriter appeared, a revolutionary design with all the letters-and symbols (eighty-eight of them) fitted on a revolving metal head about die size of a golf-ball. The typewriter gave birth to a range of business machines. It is still one of the most important parts of computers today. Children often learn to type at school. Yet of all the machines which are part of our everyday lives, the typewriter is probably one of the most complex and precise. The invention took over a 150 years of development before a practical model ever appeared on the market.